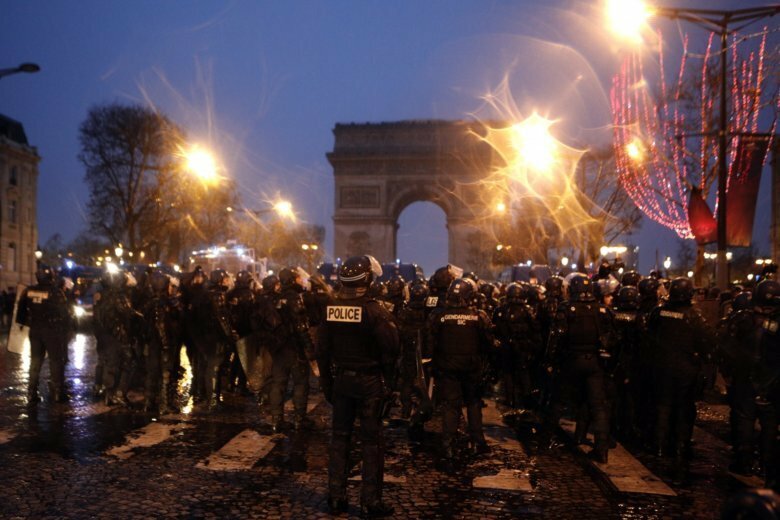 PARIS (AP) — Seeking to soothe police forces demanding improved working conditions, the French government on Tuesday proposed giving 300-euro ($340) bonuses to officers deployed to the aggressive and disruptive protests that started last month. French President Emmanuel Macron committed to the idea of protest duty pay earlier this month. The government’s offer came a day after two police unions announced work slowdowns to protest staffing and other budget issues. It wasn’t clear if the proposed premiums would calm the growing anger in police ranks. Discussions between police union representatives and Interior Ministry officials Tuesday were suspended after three hours and set to resume Wednesday morning, according to the primary unions represented at the meeting. “We are not for sale and we can’t be bought. It’s certainly not with this bonus that the crisis will be resolved,” Yves Lefebvre, of the Unite-SG Police FO union, said before the ministry meeting. According to government figures, the bonus will be paid to 111,000 police officers and military personal and will cost 33 million euros ($37.5 million.) The National Assembly is expected to debate it during discussions on the 2019 budget. Instead of a bonus, police unions are asking for the payment of thousands of hours of unpaid overtime work that has accumulated over the years. The Alliance union urged the government to invest in rebuilding the country’s police forces while calling for a work slowdown Wednesday. Alliance is encouraging police forces to stay inside their stations and only to respond to emergency calls. The unions also have complained about what they said are strained resources as officers have been sent in to clear road blockades and to control trouble-makers at street demonstrations over the past month. The yellow vest protests, named after the fluorescent safety vests French motorists must carry, started last month over rising fuel prices. They since have morphed into a mass show of dissatisfaction involving pensioners, people without jobs and small business owners. The UNSA union threatened to mimic yellow vests protests and to occupy roundabouts if its demands were not met.